Misconception about the help of divine chariot. Since Karna fans like to cover up the facts and hide the true story about his defeats by saying that Satyaki had a special chariot given to him and a special driver like Daruka. Satyaki only had that special chariot and Daruka for less than an hour during the Jayadratha-Vadha Parva for a short amount of time. He got it after he killed Bhurishravas and lost it after the end of the battle. Satyaki still yet defeated Karna many times. Satyaki defeated Karna even during Karna Parva when Karna had Shalya as his charioteer. When Karna was made generalissimo of the Kaurava army still he was defeated by Satyaki. Satyaki defeated Karna during the day of Drona's death as well. Satyaki defeated Karna and his son Vrishasena before Karna killed Ghatotkaca too. Satyaki even defeated Karna during the 12th day. As that slayer of foes, viz., he of Dasharha's race, is acquainted with horselore, even so is that mighty car-warrior, viz., Shalya acquainted with horselore. There is none equal to the chief of the Madras in might of arms. As there is none equal to myself in weapons, so there is none equal to Shalya in knowledge of steeds. A new cat was brought for Karna also, O king, unto which were yoked four steeds of the best breed that were decked in trappings of gold and white as conchs or milk. Its kaksha and standard were made of gold. Furnished with banners and machines, that foremost of cars had an excellent driver. And it was furnished with a profusion of weapons of every kind. Mounting on that car, Karna also rushed against his foes. So Karna fans really cannot talk about having a special chariot. Also any advantage Satyaki's chariot gave him would be evening out the plainfield as the same day Karna received a backup team of warriors like Aswathama, Vrishasena, Kritavarman etc. So why is this a excuse for Karna's defeat? Don't try to say that Karna was under the influence of Krishna's illusions. Krishna only stopped Karna from using his vasavi dart not anything else. And this illusion only affected Karna up until the 14th night. During the 15th day their was no illusion yet Satyaki defeated Karna. During the 16th day their were two times where Satyaki fought Karna. He defeated him the first time and proved to be a better warrior than karna in the second instance. During the 17th day their were several times where Satyaki performed better than Karna (during their encounters). Here is a screenshot from Debroy's translation of BORI Mahabharata. Now for the question i wanna know how did Satyaki defeat a warrior like Karna? The same Karna that Bhishma labeled a Double Maharatha. The same warrior that Krishna offered everything. The same warrior who Krishna called superior to Arjuna. Drona also defeated Satyaki, Burishravas defeated Satyaki, but the same Satyaki was able to defeat Karna countless times. I asked this question and seeing people who love to keep spreading anti pandava posts and love to keep glorifying karna by spreading fake stories i have decided to make an answer to this question. The simple answer is that the reason Satyaki won so many times is because he was a better warrior than karna, a better archer than karna and many karna fans never decide to accept this. What to speak of karna? Satyaki even defeated Bhishma. Desiring to do that which would bring pleasure to Bhima, Satyaki used his arrows to swiftly bring down the aged Kuru’s charioteer. When his charioteer was killed, Bhishma, supreme among charioteers, was borne away from the field of battle by horses that were as fleet as the wind. O king! When the one who is great in his vows was thus carried away, Bhimasena blazed, like a fire consuming dry grass. Analysis: Bhisma failed to reign over his horses so he was defeated by Satyaki. Bhisma as a great warrior should have been able to protect charioteer (driver) but could not, and thus he was forced to flee the battlefield. Fleeing is a defeat. "At that instant, Satyaki, the brave descendant of the Shini lineage, devoted to the truth, attacked the grandfather. He began to kill the enemy with his firm bow and made the soldiers of your son tremble. He was borne on silver steeds and unleashed arrows from his firm bow. O descendant of the Bharata lineage! Among all those on your side, there was no second one capable of withstanding him.176"
Analysis: Satyaki tooled Bhisma in this fight, Bhisma did not even fight back. And in the next line a demon known as "Alambusha" has to save him (Bhisma) from Satyaki. Source: Bhishma Parva Section 59 Regarding Karna defeating Satyaki he only defeated Satyaki on the 17th day, before that Karna never ever defeated Satyaki in his entire life. Even on the 16th day in Karna Parva when karna was the commander of the forces he ran away from Satyaki. At this, Karna, leaving Satyaki quickly pierced Arjuna with three arrows and Krishna with twenty, and Partha again repeatedly. Although many were the arrows that he shot while slaying his foes in that battle, like Indra himself inspired with wrath, Karna yet felt no fatigue. Meanwhile Satyaki, coming up, pierced Karna with nine and ninety fierce arrows, and once more with a hundred. On the 17th day Satyaki defeated Karna again. Then Satyaki, of immeasurable soul, O Bharata, placing himself on the side of Bhima's car, began to afflict Karna who was in front of Bhima. Though exceedingly afflicted by Satyaki, Karna still approached Bhima. http://www.sacred-texts.com/hin/m08/m08051.htm Not to mention all the times Satyaki defeated karna on the 12th day, 14th day etc. Satyaki even defeated karna on the 14th night (Ghatotkatcha's death day). Also karna never fought Satyaki fairly, he did a group attack on Satyaki. Here is the screenshot. It was not known later what happened, most likely the Kaurava warriors (Karna, Drona, Duryodhana and Jayadratha) defeated the Pandava warriors (Satyaki, Bhima, Dhrishtadyumna, Arjuna, Nakula, Sahadeva and Abhimanyu), because many times Sanjaya skip the narrative in some fights, when they are great victories for the Pandavas narrates the whole fight while in a fight where a Pandava warrior achieved a great feat to his enemy, does not finish telling the fight. A clear example is Kritavarma, who on the 14th defeated many Pandava warriors but Sanjaya does not narrate it. He told me that several Pandava warriors attacked him in a group. Sanjaya did not finish telling the fight but none of them crossed the defense of Kritavarma , it is obvious that he defeated all of them. Day 12: Karna, Jayadratha, Drona and Duryodhana> Arjuna, Bhima, Dhrishtadyumna, Satyaki, Nakuka, Sahadeva and Abhimanyu. "O great king! The best of chariots was also brought for Karna." There were well-trained horses that had a great speed and they were as white as conch shells or milk. "The harnesses were colorful and golden." The sides and standard were made There were many weapons and garments and there was a good charioteer, Ascending this chariot, Karna rushed against the enemy again. Obviously, enemy refers to Satyaki, since there was no other Pandava warrior who was fighting against Karna. Sanjaya does not narrate again the fight between Karna and Satyaki, but if I narrate how Satyaki defeated Ashwatthama, Kritavarma, Dussasana and thousands of warriors. It is obvious that Karna defeated Satyaki, but Sanjaya does not narrate it again. "On seeing that he was advancing, Radheya pierced him back with ten swift arrows, O great king! While all those brave ones looked on, Satyaki asked him to wait and not run away, and then pierced him with ten arrows. the powerful Satyaki and the great-souled Karna was terrible, like that between Bali and Vasava, with the slapping of his palms, Satyaki, bull among the kshatriyas, frightened all the kshatriyas and pierced the lotus-eyed Karna back. Making the earth tremble with the roar of his bow, the powerful are of a suta fought against Satyaki Karna pierced Shini's descendant back with hundreds of arrows-vipatha, karni, naracha, vatsadanta and kshurapra 190 In that way, Yuyudhana, foremost of rathas among the Vrishni lineage, showered down arrows on Karna The Karna's armored are 191 quickly pierced Satyaki from every direction with sharp ar The Lord Satyaki used his weapons to counter his weapons and those of Karna. I have angrily pierced Vrishasena between the breasts. O Lord of the earth! Pierced by that arrow, the valiant Vrishasena lost his senses. I have discarded his bow and fell down on his chariot. Karna thought that maharatha Vrishasena had been slain. He was tormented by sorrow on account of his son and afflicted Satyaki. Maharatha Yuyudhana was oppressed by Karna. But he repeatedly struck Karna back with many arrows and with force. I have pierced Karna with ten arrows and Vrishasena with seven. Satvata severed the bows and arm-guards of both. They 192 strung other bows that were capable of terrifying the enemy and pierced Yuyudhana from every direction with sharp arrows. That battle raged on and it was destructive of heroes. " Sanjaya again, does not finish narrating the fight between Karna and Vrishasena vs Satyaki, but if he narrates how Satyaki killed his parshni, he cut his bows and left Vrishasena unconscious? Obviously, Karna and Vrishasena defeated Satyaki. On seeing that Bhimasena's immensely strong are engaged with Alayudha, the mighty-armed Karna had attacked the Panchalas. He drew his signature bow all the way back and releasing arrows with drooping tufts, pierced Dhrishtadyumna and Shikhandi with ten arrows each. 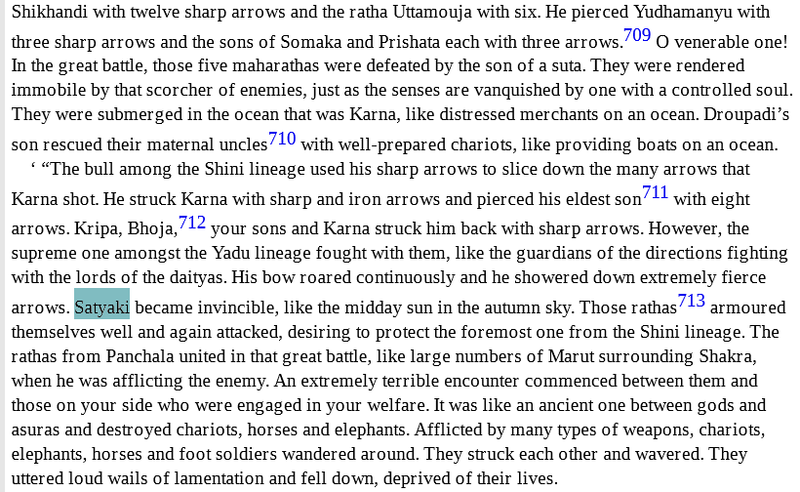 The supreme among rathas used other iron arrows and made Yudhamanyu, Uttamouja and Satyaki tremble. O Lord of Men! Both on the left and on the right, all their bows could be seen, drawn into circles as they fought. There was the twang of bowstrings, the slapping of palms and the clatter of chariot wheels. During the night, these sounds were tumultuous, like that of clouds at the end of the summer. O king! The battle was beautiful, as if between clouds. The twang of bowstrings and the clatter of wheels were the roar. The bows were drawn into circles. The standards were like peaks. The torrent of arrows was like rain. Vaikartana was like a mountain that did not tremble. I had the essence of a large mountain. Or Indra among men! In that battle, the scorcher of a large number of enemies repulsed that hail of arrows and it was wonderful. " Night 14: Karna and Vrishasena> Satyaki. Karna> Satyaki, Dhrishtadyumna, Shikhandi, Yudhamanyu and Uttamaujas. Satyaki, for whom truth was his value, roamed around in the paths of the chariots and was within the reach of Drona, Karna and Kripa. On seeing this, the great-souled Vishvaksena 100 and Dhananjaya honored Varshneya 101 and applauded him, since the undecaying one had repulsed the divine weapons of all the warriors. Vishvaksena and Dhananjaya descended on the soldiers. Dhananjaya told Krishna, 'O Keshava! Behold. Satyaki, for whom truth is his value, and who is the extension of the Madhu lineage, is sporting around before the preceptor. But what about that? Drona defeated Satyaki many other times, literally Drona's first combat as commander were many Pandava warriors including Satyaki and Arjuna, but Drona easily defeated them. "The bull among the Shini lineage used his sharp arrows to slice down the many arrows that Karna shot. I have struck Karna with sharp and iron arrows and pierced his eldest are 711 with eight arrows. Kripa, Bhoja, 712 your sons and Karna struck him back with sharp arrows. However, the supreme one among the Yadu lineage fought with them, like the guardians of the directions fighting with the lords of the daityas. His bow roared down extremely fierce arrows. Satyaki became invincible, like the midday sun in the autumn sky. Those rathas 713 armored themselves well and again attacked, desiring to protect the foremost one from the Shini lineage. The rathas from Panchala united in that great battle, like large numbers of Marut surrounding Shakra, when he was afflicting the enemy. An extremely terrible encounter commenced between them and those on your side who were engaged in your welfare. It was like an ancient one between gods and asuras and destroyed chariots, horses and elephants. Afflicted by many types of weapons, chariots, elephants, horses and foot soldiers wandered around. They struck each other and wavered. They uttered loud wails of lamentation and fell down, deprived of their lives." Not the answer you're looking for? Browse other questions tagged mahabharata krishna arjuna karna satyaki . How many wives did Arjun have?